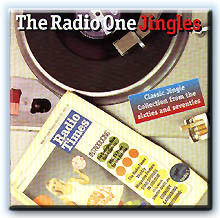 This CD contains 99 jingles from the golden age of BBC Radio One including: 'The voice of Radio One' & 'Music hour by hour from your Tower of Power' plus many other memorable jingles. This vintage PAMS recorded collection is now a collector's item, available on CD. 3. Much more bright, exciting Radio One music! 4. 247 Radio One, non-stop music! 5. Britain's zingiest Radio One, music now! 7. Radio One is Wonderful, it's too much! 9. Much more Radio One music! 15. Radio One good time music - Right! 20. Wonderful, too much, Radio One, it's great, the greatest! 21. Radio One is big news, the greatest! 22. Radio One - Super! Zingiest BBC! 24. Radio One's midday spin, balanced music pin! 26. It's a merry-go-round of musical fun, Radio One Funderful BBC, Fuuunnn! 37. Radio One (music) scene! 57. Upbeat BBC, Music Power! 58. Here's the Radio One and Two Powerpick! 64. Chart climbers, it's too much, hear them on BBC! 65. Soul Music, 247 Go on BBC! 67. 247 Wonderful BBC, another hour of Music Pow Pow Power!